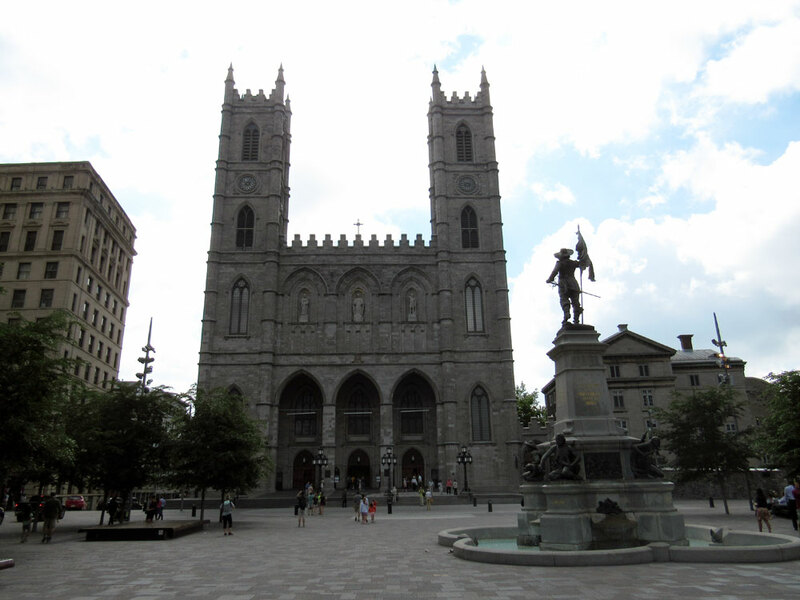 Montreal's Thousand Steeples July 7, 2015 · 20 min. readThis article may contain affiliate links. For each steeple in Montreal there is a different side to the city. Some say there is a hundred steeples, other say there is a thousand, but to me the story lies not on the rooftops, but in the streets. At almost 375 years old, Montreal has seen a lot of change. Belonging to the countries of France, Britain and Canada during its existence, Montreal has had to adapt to an ever changing view of the world. Quebec in general is known across Canada as being "that province"; the one that doesn't want to change, the one that doesn't like anybody, and the one that wants to separate. However, this stigma is incorrect and Montreal is an example of this. It isn't that Montreal despises Anglophones, but instead it prides itself on being Francophone. Montreal embraces the idea of a united Canada, and has always tried to find unity through similarities rather than division through differences. In turn, Montreal welcomes people from all over the world, French, English or otherwise. They accept people from all walks of life because, to them, they are from the "other" walk of life. In an attempt to learn more about the city, I stumbled upon a cathedral in the heart of Montreal named Notre Dame. It is here where we find the first side of Montreal's complicated persona, one that formed the city into what it is today. Founded in 1642 by the Jesuits, Notre Dame was a small, wooden church in the village of Ville-Marie. Fifteen years later, in 1657, the Sulpician Fathers arrived and constructed a much larger church. It would take almost three decades for the church to be built, and it was completed by 1683. One of the reasons for this long construction period was due to Montreal's harsh winters where the ground became frozen, and they could only dig four to five months of the year. Added to that, midway through construction the British invaded and Montreal fell under British regime. One hundred and forty years would pass when a larger church was needed. The stunning Baroque style church was then dismantled and replaced by the Gothic Revival style church we see today. It was completed in 1829, minus the bell towers. It would take until 1843 for the towers to be built. The first tower, named Perseverance held the bell "Jean-Baptist", which was a massive, 24,000 pound bell. This bell is so large that when rung, it can be heard for 35 kilometers around the city -- which is the entire city. It's also so big that when it rings, it causes structural damage to the cathedral. As a result, it's only rung twice a year: on Christmas and Easter. It is also rung on very important occasions, such as the funeral of Pierre Elliott Trudeau, Canada's 15th Prime Minister. The bell is so important in fact that it wasn't even rung during the extravagant wedding of Celine Dion in 1994. The second tower, Temperance, contains 10 small bells which ring every hour. In 1889, it was decided the cathedral was too big for smaller functions like marriages, baptisms and funerals and so a smaller chapel was built behind the massive structure, called "Our Lady of the Sacred Heart". This beautiful chapel was decorated with bronze and gold, and was a striking difference from the blue glass and the dark oak of the cathedral. Ninety years later, in 1978, the gold and bronze of the chapel fell to disaster when it was set ablaze by an arsonist whose identity remains unknown. The fire burned for days, gutting the interior. It was rebuilt to look as close as possible to the original design, with the addition of a massive mural at the front of the congregation. 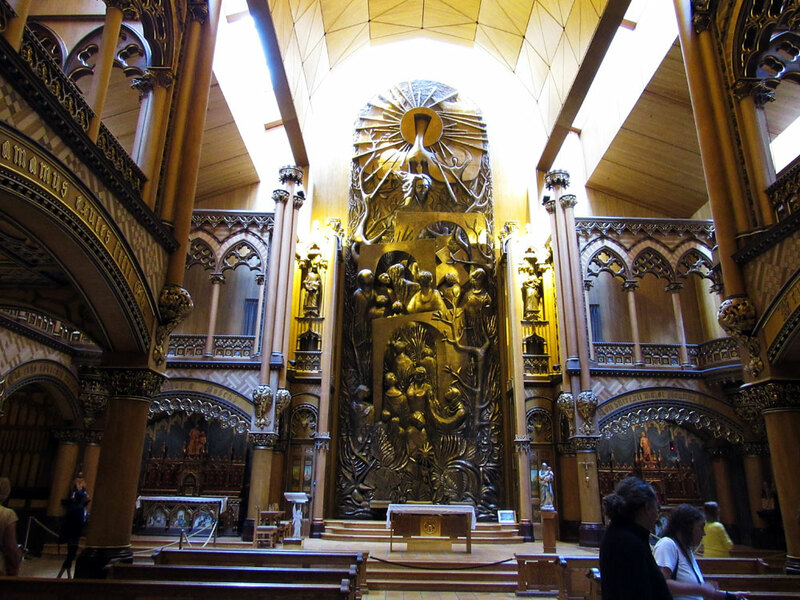 While known for its churches and religious heritage, Montreal is also known for its artistry. This was seen by the world in 1967 when Montreal hosted Expo 67, under the theme "Man and His World". Montrealers also took this opportunity to showcase their city as one of the finest in Canada, as this was also the year of Canada's centennial. One project done in preparation for these events was the widening of Saint Helen's Island, and the unbelievable creation of Notre Dame Island. Today these two islands host a vast collection of Montreal's history, such as military forts, green space, environmental exhibits, amusement parks, an aquatic complex and some remaining statues from the Expo. While the metro does go to Saint Helen's Island, so does the Eiffel Tower inspired Jacques Cartier Bridge, built in the 1920s. I chose to walk this bridge to the island as there are no large bridges like this where I am from. It took a lot longer than it would driving, and the steady rumble of traffic was deafening, but the journey across the mighty St. Lawrence River offered an incredible view. Getting down from the bridge, however, was not as easy as getting up. The side I was on had a pedestrian detour, so I was forced to cross under the bridge. 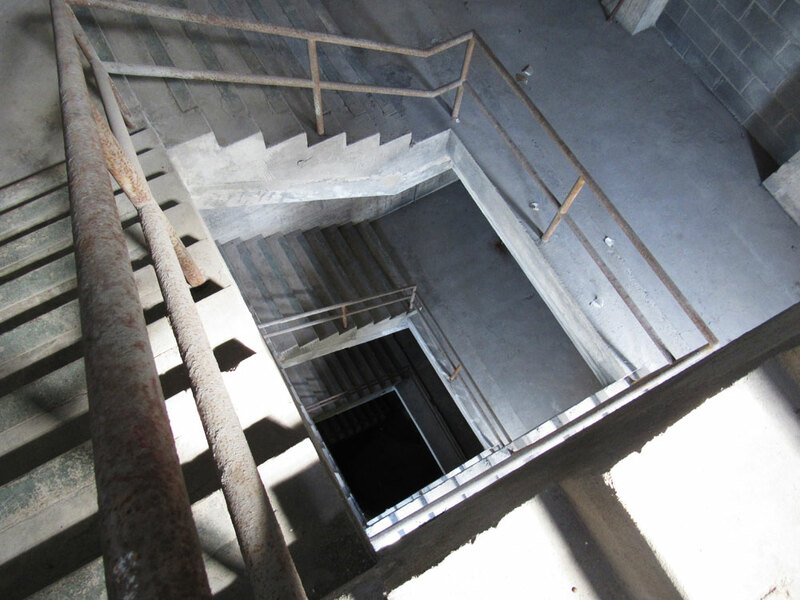 Not wanting to go to the other side (I wanted down), I found a stairwell that lead to a lower floor. I believe now that this door should probably have been locked. I have seen many decrepit places in my travels, from abandoned houses to rotting cemeteries, but this stairwell was one I'll never forget. The floor near the detour sign was solid and smooth, but this floor was pitted and rough. The steps down were crumbly, the handrail was rusty, and the lights were all smashed. Fresh cigarettes and rubbish told me that people had recently been here, so I assumed there must be an exit. The first door I found didn't open. The window was yellow, but I rubbed it and looked inside. All I could see was a massive room with large, imposing windows. It was empty, with nothing inside. I carried down the stairs, with the next door being bricked over and the third door was welded shut. 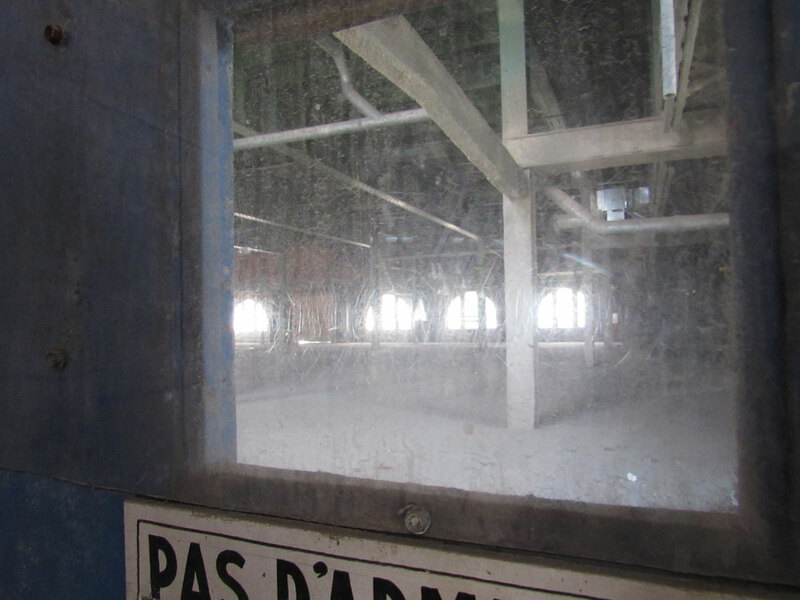 By now, I could see from the windows of the structure I had entered that I was near the ground. A few steps further and I began to smell the musk of dirt and water. Around a corner I went, and my feet touched the ground. Before me was a large door, with a massive sheet of plywood covering it, opening into an entrance of blackness. I took out my phone, turned on the flashlight and shined it into the darkness. I couldn't see anything. I decided then it was time to leave. 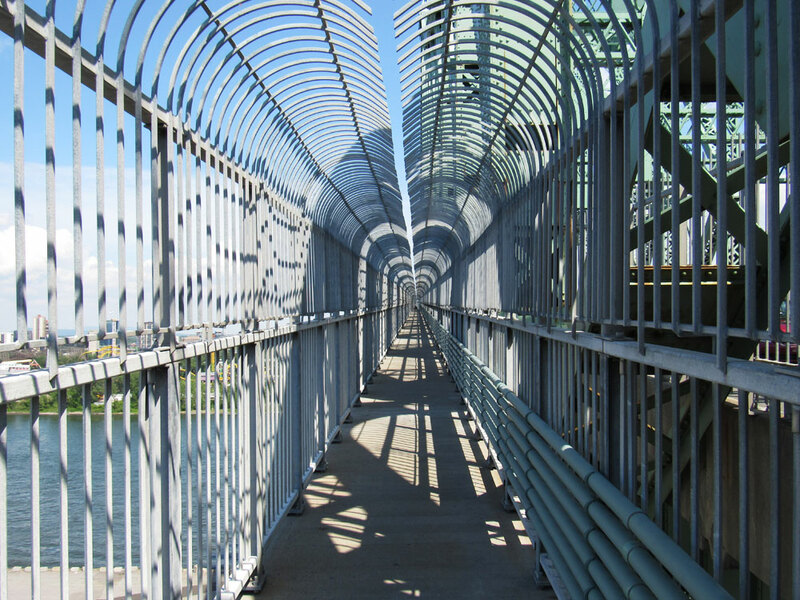 I hadn't realized it at the time, but I had somehow stumbled my way into "Montreal's Most Overlooked Architectural Gem", the Jacques Cartier Bridge Building (that link is very interesting). Having been built in the 1930s, this Moroccan style building is covered with Islamic iconography, but besides that, I don't know what it was used for. But I do have some ideas. A search online turned up nothing by rumors. One Reddit user says it was built as a pumping station, almost 100 years ago. Others say it's a storage building, being converted into a community/cultural space. A third person says it was used for hangings. This last rumor, as strange as it may be, might be the closest to the truth. During the 1930s and 1940s Saint Helen's Island wasn't used for its green space, but as a Prisoner of War camp. The camp was simply called "Number 47", and the prison guards forced German and Italian POWs into heavy labor. By 1944, "Number 47" was dismantled under a report about the brutal treatment of its prisoners. Could this building be part of "Number 47", left alone because it supports sections of the Jacques Cartier Bridge? I'll never know. UPDATE: I contacted Visit Montreal and figured out what this building was. It was built in the 1920s and was suppose to be a massive ballroom hall and exhibition hall, but was closed before it could open in the 1930s. It is being renovated currently to eventually have spaces rent out inside! Check out more about it on their website! Down Saint Helen's Island, far from the Jacques Cartier Bridge Building, lies the Biosphere, one of Montreal's most iconic buildings. This massive sphere was built for Expo 67 as a museum to the environment, and originally had a complex shell of acrylic cells used to regulate temperature. The museum was built around the idea of a "Spaceship Earth", that was essentially our planet with limited resources, and our need to find ways to preserve it. On May 20th 1976, a fire broke out inside the sphere, burning away the acrylic cells, leaving only the metal skeleton behind. The site would be closed for 14 years. In 1990 it became a museum showcasing the waterways and ecosystem of the St. Lawrence River. In 1995 it became a water museum, and in 2007 it became an environmental museum, focusing on water, climate change and sustainable development. 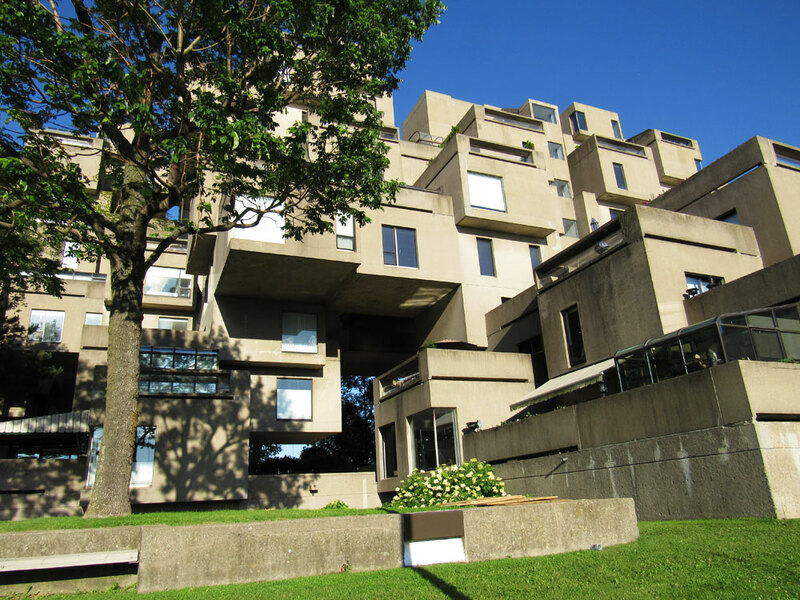 Across the island there is another bridge, and across that is one of the reasons I went to Montreal: Habitat 67. 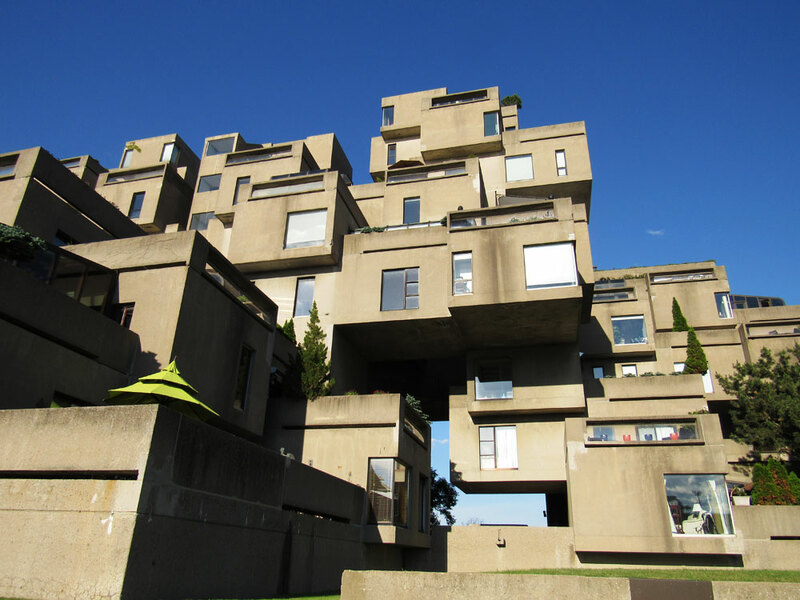 Habitat 67 was created during the Expo, and its purpose was to find an architectural structure that harmonized humanity with nature, through the use of 354 identical concrete cubes. It was an approach that incorporated green space, privacy and urbanization. It was a proposed building for future generations. Unfortunately, it was much more expensive to construct than a typical building, and while the structure had several "stages" before reaching its ultimate design, it was prematurely ended after only finishing the first stage. 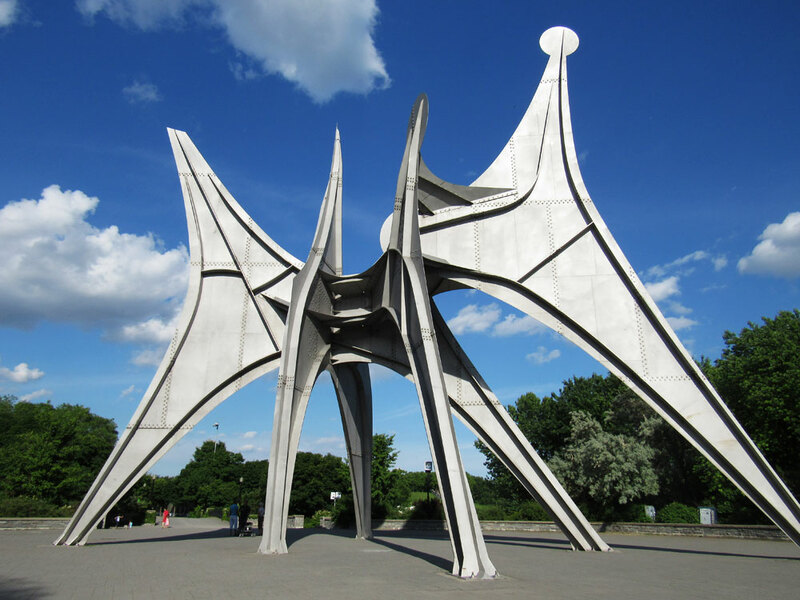 Today, the building is seen as an architectural wonder, and is used as inspiration for many futuristic structures. It's also seen as a failure; as its price to build is unrealistically expensive; when it was supposed to be an alternative to cheaper housing. The building is now on private property, and is fully inhabited. There are rooms for rent, but you have to contact the landlord directly to get pricing. While Montreal is very proud of its futurism and ground breaking ideas, it also has its share of museums. This includes everything from art galleries to environmental domes to planetariums to insectariums to sports museums and archaeological museums. 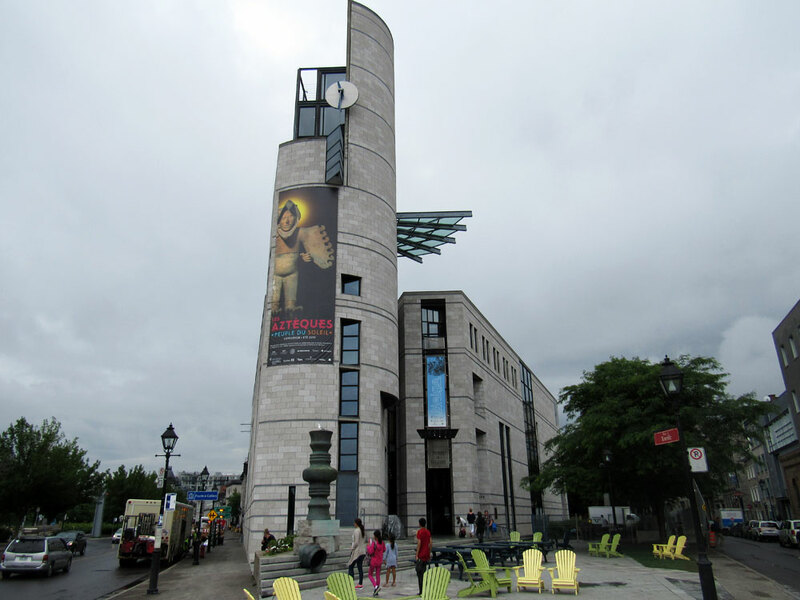 I visited several of these, but the most interesting museum I found was the Montreal Museum of Archaeology and History. The Montreal Museum of Archaeology and History features the origins of the building and its history on the impact of the city. 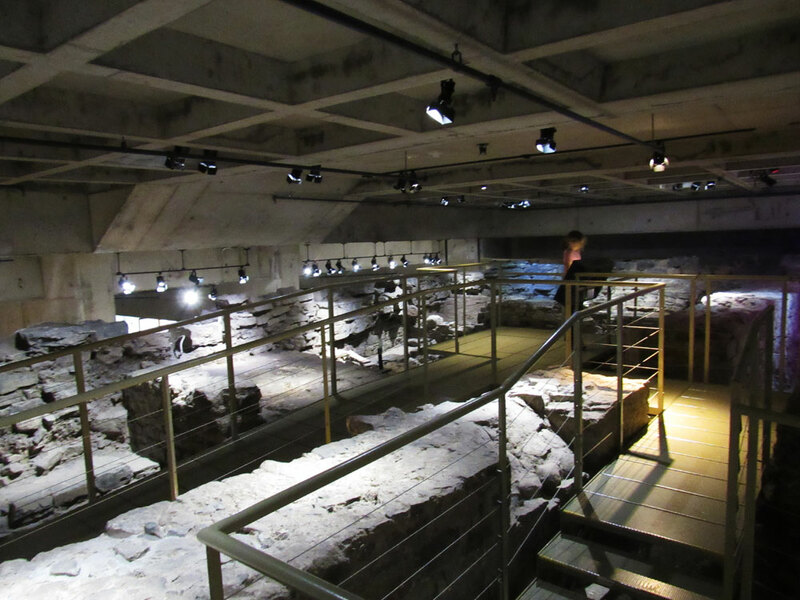 The museum is built as an interactive learning center, and takes the user back almost 500 years up to the modern day. The museum starts with the discussion of the Iroquois First Nations, a very violent tribe that lived in the area. They were the largest of the tribes, and were often at war. Unlike the Cree in Western Canada which moved every four years, the Iroquois made semi-permanently settlements where they remained for several decades. Their houses were wooden huts, looking very similar to African housing, and they surrounded their settlements with sharpened stakes of wood. Jacques Cartier discovered the village, named Hochelaga, in 1535. He reported back to France that there were thousands of denizens in this and the next village, Tutonaguy. When Cartier returned several years later, both villages were abandoned. Nobody can explain why they moved, or why their settlement was so fortified as the tribe had nothing to fear. In time, New France spread down the St. Lawrence and into the Great Lakes, hooking into the Mississippi River and flowing down into the Gulf of Mexico. By having control of the St. Lawrence River, New France expanded its empire across the majority of North America, traveling as far west as Hudson's Bay and as far south as Florida. As the French settled, trade with the First Nations became imminent. Unlike the British, the French and First Nations found general peace with one another, and often shared the land and resources. A grave was found near the Museum of Archaeology and History that showed a fence dividing the First Nation and French graves, and how both were treated with respect and dignity, and at times customs even seemed to overlap. However, at times there were conflict, and if New France was ever to establish itself, it needed permanent peace. In 1701 this happened, with "Great Peace of Montreal", a meeting between New France and 40 First Nation tribes from as far away as the Gulf of Mexico. Discussions were made, laws were created and peace was founded across much of North America. 19th century historian Francis Parkman says, "Spanish civilization crushed the Indian; English civilization scorned and neglected him; French civilization embraced and cherished him." With peace established for 50 years pending the British invasion, Montreal grew quickly and became one of the greatest cities in North America. Under the British, Montreal's population exploded from 9000 in 1800 to 35,000 by 1850. Today the population is around 3 million. This unprecedented growth saw a mix of cultures and languages, along with many challenges. One was the fire of 1852 which left 10,000 people homeless. Another were the epidemics that ravaged the city during the 1870s, killing thousands. It was during this time that the Montreal Insurance Building was made, which became the most iconic building in Montreal due to its size and close proximity to the busy coastline. The Montreal Museum of Archaeology and History is built on the grounds of the old Montreal Insurance Building after its foundation began to rot and its iconic clock tower began to lean dangerously. In fact, the museum is built in a shape similar to the old Insurance Building. The museum carried into an additional exhibit, one that goes back to the 1670s, right after New France was captured by the British. At this time, the French king attempted one final stand against the British, but instead of an army, he hired pirates. This section discusses piracy on the St. Lawrence, and the battles that took place between the two countries. It discussed cleanliness (or lack thereof), scurvy, cannon fire and lightly mention prisoners and torture. The exhibit begins with the pirates being hired to go to Newfoundland and Labrador, climaxes with the battles on the St. Lawrence, and ends with their arrival. Although I don't know my history of the Maritimes that well, with Newfoundland and Labrador being the only bilingual province in Canada, I imagine the French conquest was a success. Through religious conflicts, wars, piracy, and disease, Montreal's history is long, twisted, and spans three regimes. At one time, Montreal was the gateway to North America, and at another time, it was the capital of Canada. Today, this world-city shows us not only our past of cobblestone and copper roofs, but our future in cubism and "Spaceship Earth". 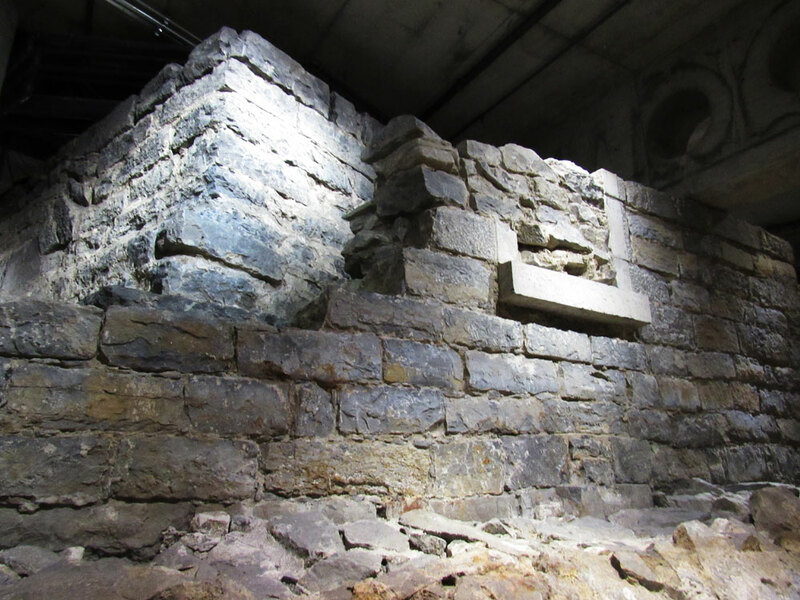 There are mysteries under the streets, and questions among the rooftops, but much like the exact number of green steeples that are scattered throughout the city, some parts of Montreal's history might forever be unknown.